I was awake by 5 a.m. 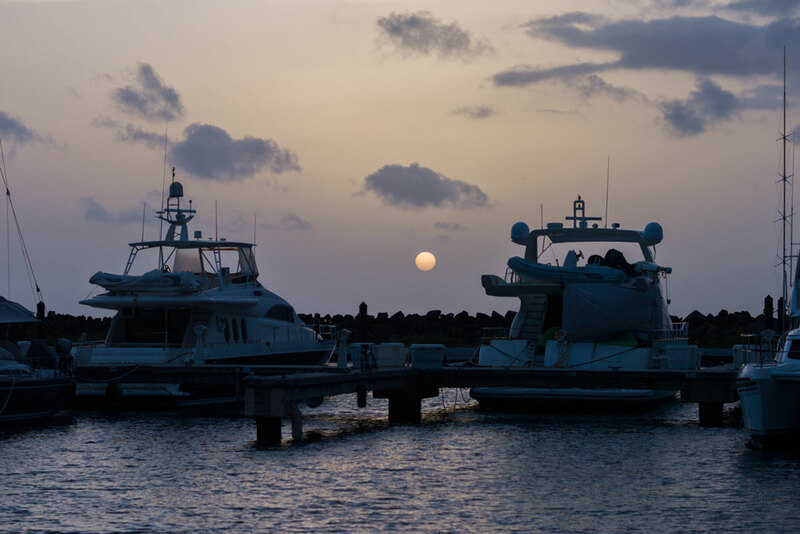 Even though we hadn’t yet left the marina, being on a catamaran sitting in blue water in a tropical location made it harder to stay in bed than Christmas morning. I grabbed the camera and took a walk through Puerto del Rey enjoying the silence and solitude. Eventually, one by one, the members of our various crews began appearing from their vessels. It was quite comical to watch each person attempt to quietly disembark from an unfamiliar boat with hidden magnets on the backs of doors and hatches that caused them to bang open loudly. Stealthy they were not. When I got back to Caicu, our Lagoon 400, there was a waterfall starting in the salon and running down the stairs into the port ama. A quick investigation revealed the salon air-conditioner was the culprit. The pump that was supposed to be draining the condensation out of the boat was not functioning, and the water had developed into quite a pool under the seat. It had obviously be doing this for some time as the wood at the corner of the couch was discolored and starting to rot. The commotion of pulling apart the couches and sopping up the water, we woke up the rest of the boat. They were not as excited to be up at the crack of dawn. We wandered up to the small café near the Sail Caribe office for breakfast. Service was quick and the food was very reasonably priced. Then after breakfast we wandered by the ship store, which wasn’t yet open, and stopped into the small convenience store to see what they carried. They had a nice variety of cereals and canned goods, but after realizing we had plenty of space in the freezer on our Lagoon 400, Caicu, we were hoping to score a couple frozen pizzas. Sadly, that was not something they carried. 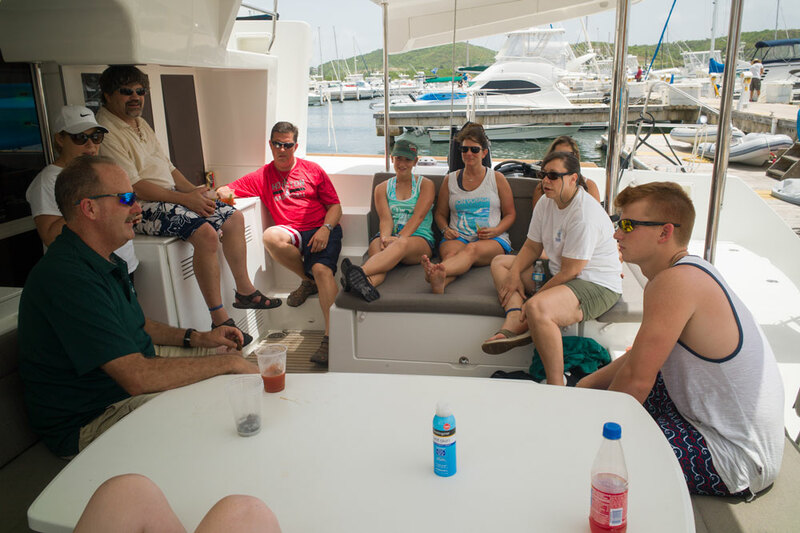 Once back at the boats each crew began a boat briefing with a representative from Sail Caribe. Our rep was Pedro. 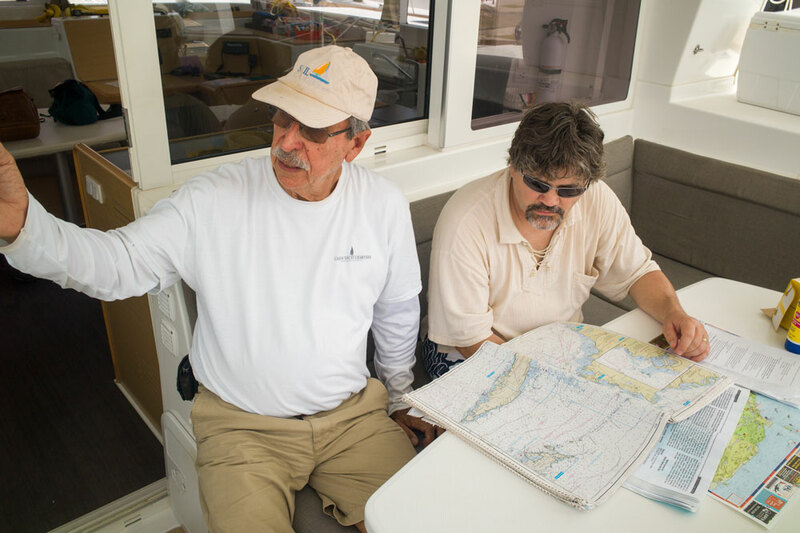 He walked us through every system on the boat, showed us where to find all the battery switches and breakers, and helped us do an inspection of all the systems. We started the engines. We started the generator. We lowered and started the dinghy. Everything except for that air conditioner condensation pump seemed to be in good working order. 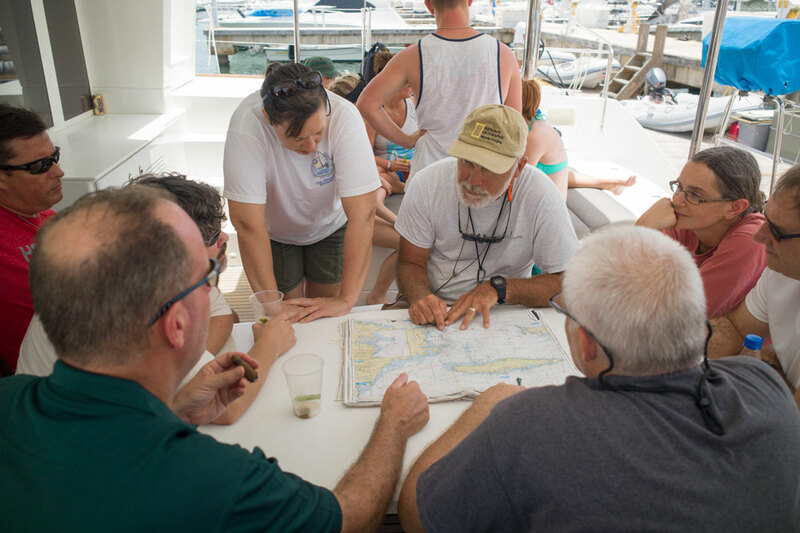 Once we finished the boat briefings we all congregated on Batubara, the Lagoon 450, for a chart briefing with Graham. He set a few ground rules and walked us through our planned itinerary. The north side of Vieques was off limits, which wasn’t a problem, and the north side of Culebra where we had planned to anchor one afternoon to visit Flamenco Beach was off limits. However, he showed us where we could moor on the west side of Culebra to then be able to walk across to Flamenco beach. He also familiarized us with the local rules and regulations. For instance, you can’t pull your dinghy up on the beach anywhere in the Spanish Virgin Islands because it might damage a turtle nest. That was an important thing to know, both for us and the turtles. We met Pedro back at Caicu for our last test before embarking on our week-long adventure. He had Andy, who was our captain for the week, drive us off the dock and out to the end of the marina where he had to hold the boat into the wind while we raised the mainsail. 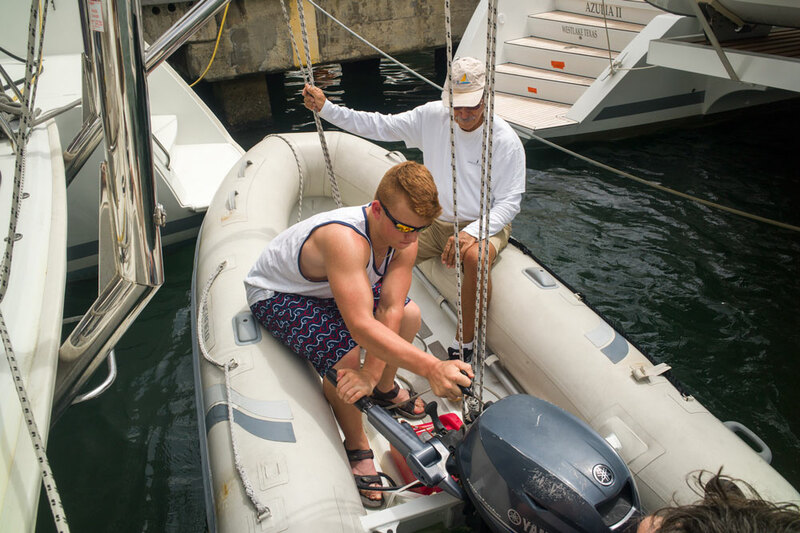 It didn’t take him long to get the hand of the twin screws, something neither of us have on our boats at home. We got the sail up and down and then headed back to the fuel dock to drop off Pedro. It was on the way out of the marina that perhaps the most adrenaline-generating incidence occurred. We were puttering along while “someone” was playing with the charter plotter. When he pressed “Go To Track” the autopilot kicked in and promptly turned us straight onto a crash course for the breakwater. There were two or three seconds of sheer panic as we fumbled to find the off switch to regain control of the boat. 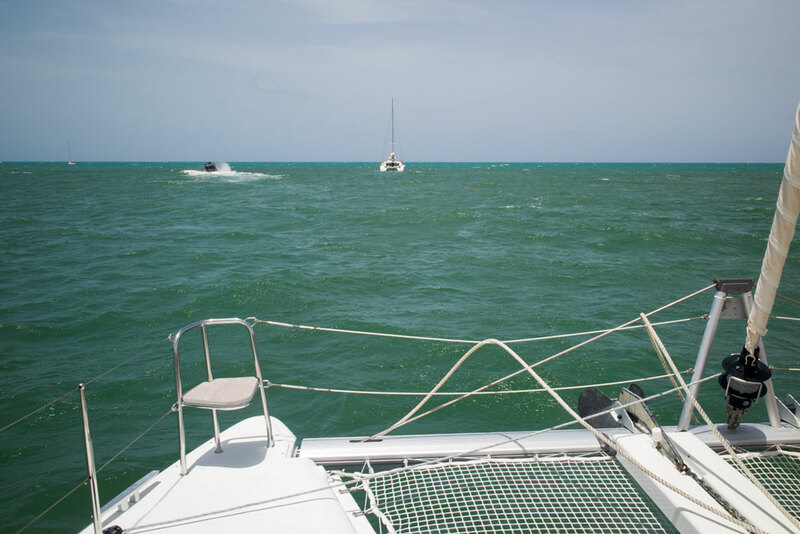 Thankfully we did not crash the boat into the breakwater and made it out into the open ocean – my first time in the Caribbean.